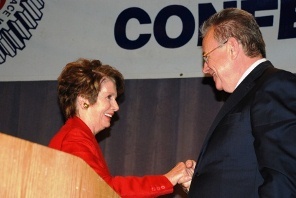 Headquarters General Vice President Rich Michalski welcomes House Democratic Leader Nancy Pelosi (CA) to the 2013 IAM Legislative Conference. Destructive austerity measures such as sequestration, said Pelosi (D-CA), are threatening the middle class and putting the American dream at risk. She railed against “stakeholder capitalism,” which since the 1990s has caused the salaries of CEOs to skyrocket to 350 times the pay of the average worker. Republicans in Congress, Pelosi said, have been more concerned about the latest scandal than passing legislation that would create jobs, raise the minimum wage, and invest in infrastructure and education. And the bills the GOP has put forth, said Pelosi, like one that would undermine the National Labor Relations Board (NLRB) and another that would end the 40-hour workweek and overtime pay, do nothing but advance corporate interests on the backs of the middle class. 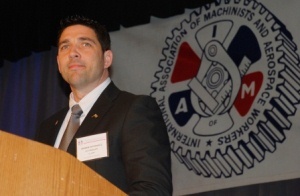 Local Lodge 1943 Vice President Andrew Hounshell speaks to Legislative Conference attendees about his campaign to unseat House Speaker John Boehner (R-OH). IAM members donated over $3,000 to his campaign this week. Pelosi was the final legislator to speak at a conference that featured the likes of Sen. Chuck Schumer (D-NY) and Reps. Tulsi Gabbard (D-HI), John Tierney (D-MA) and Mark Pocan (D-WI). Radio talk show host Bill Press and political analyst Charlie Cook joined industry leaders such as Lockheed Martin Vice President Gregory Dalhberg and Transportation Department Deputy Secretary John Porcari in addressing hundreds of Machinists at the four-day conference. IAM members also visited their congressmember on Capitol Hill, with many getting their elected officials to hang IAM flags in their offices. IAM members chipped in over $3,000 to fund Hounshell’s campaign. Click here to visit his campaign website and here for his Facebook page.